Last week brought with it a slew of activities: project submissions, presentations, and exams. The weeks in this program end soon after they begin. It’s wonderful. Our third design project for the semester centers on time, and I find this apt because — even before the design brief was released — I had taken a step back from myself to fathom just how much time had passed since the program began. As I philosophized (in my head) I was struck by the discord between the breadth and depth of my learning and the amount of time I’ve spent in the program. I represent learning in terms of bits: units of knowledge. I’m not sure exactly what is a unit of knowledge. Quantifying knowledge this way is reductive and serves only as an illustration of the relationship between the amount of time I’ve been in this program and the concomitant knowledge acquisition. A better graph might be more abstract — one without numbers and a steep positive slope. 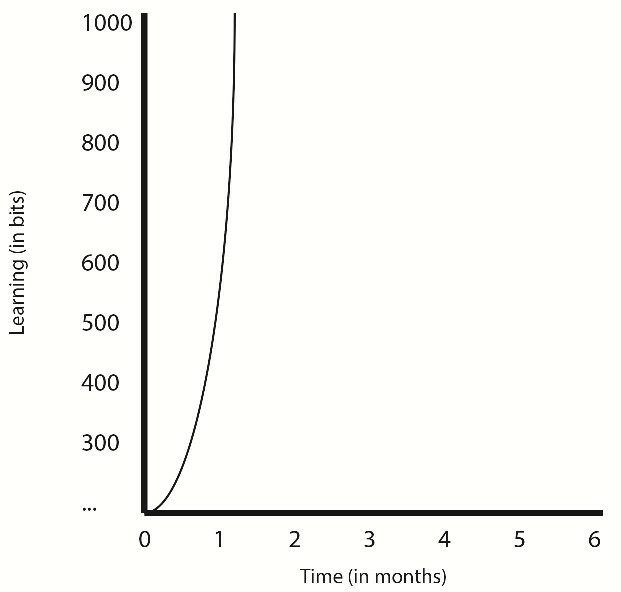 But the numbers in my graph have one thing going for them: they communicate clearly the disproportionate relationship between time and learning. For as little time as I’ve been here — .01% of what I can only hope will be a full life — I’ve learned so much. If you invest yourself fully in the HCI/d program, the intellectual and creative returns will explode your expectations. Previous Post: What do designers do?